Southern Skywatch May 2009 edition is now up! The eastern horizon an hour before sunrise on 21 May. The May edition of Southern Skywatch is now up. There is a close approach of Venus, the Moon and Mars. The eta Aquariid meteor shower is on May 6. Also there is a "blue" last Quarter Moon. Half a Blue Moon is better than no Blue Moon. Idly looking at my lunar tables recently, I noted that May has two First Quarter Moons (2nd and 31st respectively in Australia). This shouldn’t be a surprise. It takes approximately 29.4 days for the Moon to go from any given phase to return to that phase, so if a given phase falls on the 1st or 2nd of a month, it will turn up again on the 30th or 31st (of course, 28 day long February messes things up). Yet, we are (sort of) surprised when we get two Full Moons in one month. Because the time from Phase to Phase (eg Full Moon to Full Moon) is 29.4 days, and the average length of a month is 30.4 days, any lunar phase will be roughly a day earlier in the following month (except the February to March roll-over, for obvious reasons). So the Lunar phases drift through the months. For example, a Full Moon that starts on the 1st of a given month it will take roughly 30 months (or 2.5 years) to occur on the 1st again, (again, this get messed up a bit by 28 day February). At least part of our surprise is due to the vast majority of us not remembering the previous blue moons 2.5 years in the past (hey, I can’t remember what I had for breakfast, so remembering that is a bit of an ask), and partly our disinclination to remember Solar and Lunar system data and do long division in our heads. We express that surprise with a special name for the second of two Full Moons that occur in the same month, a "Blue Moon", this has come to be synonymous with something occurring rarely (Once in a Blue Moon). Although, at an average of once every 2.5 years it’s not that rare. But why don’t we have a special name for the second of two First Quarter Moons? Or for two consecutive New Moons, or Last Quarter Moons in a month? After all, they will be as rare as two consecutive Full Moons (roughly every 2.5 years). In part, it’s due to the importance of the Moon in our lives, or for those of us in the industrialised world, the lives of our grandparents. In the days before artificial lighting was wide spread and of high quality, the light of the Full Moon was needed if you wanted to hold an event at night. The Full Moon was a signpost to agricultural activities (Harvest Moon anyone), and a visible calendar. So of course people will take notice when two Full Moons occur in a month. When two New Moons occur in a month, who but the astronomers will know or care? Likewise for two Last Quarter Moons, unless you are an astronomer, fisherperson or a farmer you are not likely to be up early enough to see a Last Quarter Moon, let alone realise that there are two of them in a month. But First Quarter Moons, we all can see them, and for many of us they are companions on our way home from work. True, the impact of Last Quarter Moons on our collective psyche is less (notice how in movies or paintings or cartoons the Moon is almost always Full, or a narrow crescent, First Quarter Moons feature very rarely), but still as an easily observable Moon Phase I think we should have a name for them. How about a “Half-Blue” Moon? Any suggestions? Dates of “Blue Moons”, ie months were two of any given lunar phase fall in the same month (not just two full Moons in a month the standard definition). Note that every year has at least one “Blue Moon” of some type. Because we run a solar calendar, and the Lunar “year” is shorter than the solar one. People seem to object to the seasons moving through the year more than the Lunar phases moving through the year. Also, rather inconveniently the solar year is 365.24 days long, making it impossible to design a stable calendar of integer day length, hence months with different days in them and leap years. This usage is actually due to a writer from Sky & Telescope, earlier usages seem to have been “the third of four full moons in 3 months”. Rainbows are ephemeral, they can appear when we least expect then, then vanish away quickly. Rainbows are caused by refraction and reflection of light inside spherical rain drops (see here for a java applet showing how this works) or mist droplets , or prism like effects in glass doors and windows. To see rainbows, we need a fairly precise geometry between the sunlight and the refracting materials. So we went to Victor Harbour on the weekend, during the biggest wet in South Australia for a long time. In a brief break between downpours, I went for a walk to Granite Island (penguin webcam here), as I walked across the causeway, a brief shower swept across and as it passed, this gorgeous rainbow appeared for a short time. This rainbow is somewhat unusual, as you can clearly see it in the foreground of the ocean. Often, if the rainbow reaches to the ground, it appears to merge into the ground (hence the "pot of gold" at the end of the rainbow legends). But it was very clear that the rainbow was floating in mid air, above the sea, and it shows in this image (click to embiggen). Shortly after, the rainbow faded away to nothing. However, I was surprised by more rainbows during that weekend. Carnival of Space #100 is here. This is a special edition of Carnival of Space! We have finally reached 100 issues. And what a carnival is being hosted by the One Minute Astronomer! There's the Mars mission that never was, two shuttles on a launch pad, fantastic images of Saturn, the Kepler Space Telescopes search for alien worlds, a tour of the solar system, an interactive telescope sculpture, the new Star Trek movie, what to do with a star party when the weather won't co-operate and much, much more. So grab you digital watch and hurry over to the One Minute Astronomer for a very special double O carnival! ...rain. Mind you, we really need the rain, in fact I was getting to the point that I didn't known what rain looked like any more. But it did get a bit carried away, and the King Tide plus storm broke Semaphore Jetty AGAIN. It calmed down a bit this afternoon. I took micronephew for a walk under a lowering sky. A fantastic chip of Moon played peekaboo with the clouds. Mercury could not be seen in the confusion of clouds, but micronephew giggled and pointed at the crescent Moon, so that didn't matter. The Moon and Mercury, April 27 2009. The evening sky facing west, half an hour after Sunset, as seen from Adelaide on Monday 27 April. Similar views will be seen elswhere in Australia. Monday sees the thin crescent moon not far from Mercury. Unfortunately, both are very close to the horizon, and you will need a level horizon clear of obstacles too see them. Jupiter and Venus just shine through the cloud as I make my way to the Memorial on the beach front. As the service begins, on a theme of Justice, Mercy and Humility, Venus, named for the goddess of Love, and Mars, named for the god of War, break through the cloud. Appropriate, as we are remembering with love those lost in war, defending freedom and justice. ... is by Medievalist and cartoonist Irony Chan. Read it here. My View of the Venus, Moon and Mars line up was obscured by cloud. But it still managed to look pretty. (Yes, I know the picture is sideways, I don't know why blogger did that, it's the right way round in my other viewing software). 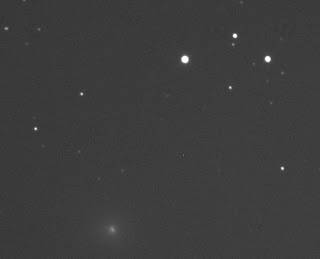 I have a account with Global-Rent-A-Scope, after over a week of frustration, where the sky was either clouded out, or I woke up far too late to do any imaging, I finally got an image of comet 2009 G1 Ruan. This is a very special comet, as it is the few comets found by the stereohunter community that can be seen by Earth-bound telescopes (mostly the are Kreutz sungrazers). I can remember the excitement after Ruan found the faint object moving in the stereo images, as the stereohunters eliminated candiate after candiate until it was clear this was a new object. If you don't have a telescope, you can enjoy C2009 G1 Ruan in Celestia or Stellarium. Shortly after the image above was taken, the clud came over the Moorook telescope site (typical). Image is a 2 minute exposure using scope G-15. Carnival of Space #99 is now up at AstroInfo. Alice bakes up a big Carnival, with a bread recipe and Space elevators, hot new exoplanets, galaxy nurseries, Yuri's night, the Hand of Hubble and lots, lots more. Grab you apron and hurry on over. Image Credit ESO (click to embiggen). The Gliese 581 system delivers again. Giese 581 is a red dwarf star 20.4 light years away that until recently boasted the lightest extrasolar planet ever found. At 5 Earth masses, Gliese 581c was not exactly a second Earth, but it and 7 Earth mass Gliese 581d captured the worlds imagination as they seemed to be in the habitable zone of their parent star, where liquid water can exist. Now the smallest mass planet ever has been discovered around Gliese 581, a 1.9 mass planet Gliese 581e, presumably rocky, that screams around Gliese 581 in a little over three days. At a mere 0.03 Astronomical Units from its star, Gliese 581e is a Mercury-like world, baking in the close embrace of the Red Dwarf. Importantly, the orbit for Gliese 581d has been refined too. 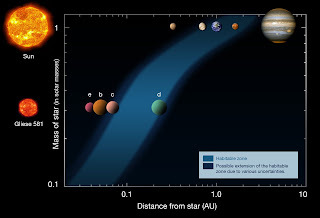 It is now definitely within the habitable zone of its star. Gliese 581d is likely very unlike Earth, and it and Gliese 581c are probably water worlds. The refinement of the orbit of 581d means it is very-likely covered in liquid water, when the planet was first described it seemed more likely it would be an ice world (but Gliese 581c is more likely to be Venus-like). Unfortunately, even though Gliese 581 is so close that we can almost touch it, astronomically speaking, we won't be travelling there for a while. You can go there virtually though if you have the 3D space rending program Celestia, I have made an ssc file for the Gliese 581 system. If you have Celestia 1.5 and above, the program already comes with Gliese 591b, c and d (you will have to comment b and c out in my file, and comment out d in the extrasolar.ssc file as it has the old orbit). Download the file Wolf_562.ssc (the alternate name for Gliese 581) and put it in your Celestia extras folder and go exploring. For the original ESO press release go here. For a PDF of the discovery paper go here. And a Nature News commentary is here. Naturally the blogosphere has already caught on. Here's Stuart's take, Centauri Dreams, Dynamics of Cats, Starts with a Bang (and his update here), Science After Suneclipse on how long it would take to get to Gliese 581 and the Questionable Authority on what this means for finding alien civilizations (and how much you would weigh on Gliese 581d). 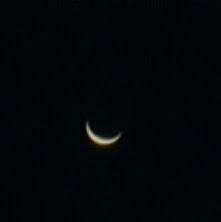 I finally got my first telescopic image of Venus for 2009. I've been making animations of the phases of Venus for a few years now. This year Venus is in a favourable alignment, and I have my new webcam (a Philips ToUCam), so I'm trying again. Of course, this means getting up at 5:30 in the morning on successive mornings for a few months, so it can be a bit of a pain. Still, the morning sky is lovely at the moment, so it's worthwhile. I used my old 4" scope for the imaging. Why? Because the drive motor of Don, the 8" scope, prevents it from going down close to the horizon. 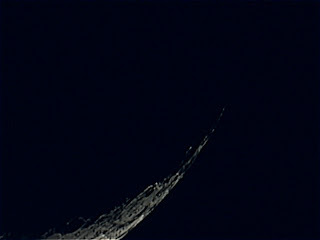 Here's an image of the crescent Moon, to go with crescent Venus. The morning sky as seen at 6:00 am, April 23 in Australia. 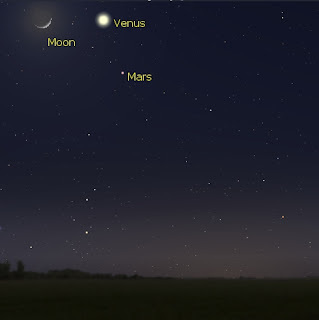 On Wednesday April 22 and Thursday April 23 the crescent Moon is near the pairing of Venus and Mars. This will look very nice indeed, especially on the 23rd, when the very thin crescent Moon is just under the very thin crescent Venus. Unlike North America, Australia, New Zealand, Africa and South-East Asia don't see the Moon pass in front of Venus (although if you are in South America, you will see Venus spectacularly close to the Moon), but the triangle Venus forms with the Moon and Mars is pretty nice (in Africa its better on the 22nd than on the 23rd. The Lyrid meteor shower peaks on the 23rd. The Lyrids produce a small number of meteors, and in the Southern hemisphere, the radiant is pretty close to the horizon (near the bright, blue white star Vega, almost due north), so rates will be lower still from our point of view, but if you are up and observing, there may well be the occasional meteor to enliven the morning sky. As well, you can watch for satellites. and look at Jupiter's moons through binoculars. A fairly good way to spend the morning overall. Pop over here to see Gerald Rhemann's fantastic image of cometC/2005L3 McNaughtamongst the galaxies on the border of the constellations Bootes and Canes Venatici. Jupiter and the Moon looked very nice together this morning (click on the image to embiggen). With Venus and Mars below the sky was very attractive indeed. Venus is the very obvious bright dot down the bottom, and Mars is just above and to the right, just above the tress. Keep on watching. 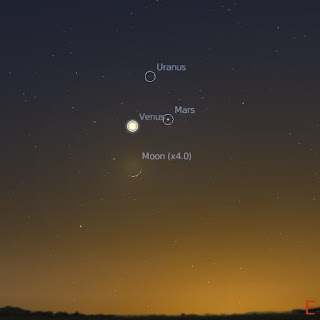 Venus comes closer to Mars, and on the 22nd and 23rd, the thin crescent Moon, Venus and Mars are close together. I could see Jupiter 15 minutes after sunrise, but by 40 minutes after, it was difficult to see with thin high cloud interfering. Without the Moon to guide me, I would have had no hope of seeing it. Venus was dead easy to see until the cloud went over it. Had a look at Venus through the 4" scope, very, very thin crescent, very beautiful. Have to drage the imager out and take some photos. As well as adding asteroids and comets, you can add spacecraft to Celestia. Here is a Celestia file for the STEREO space craft, using recent orbital elements. It's based on a file originally posted by Dimitry Chestnov. The Stereo spacecraft are slowly drifting in their orbit, so you need to update the elements periodically. I use the Horizons web interface to generate orbital elements for the spacecraft. Change the Ephemeris type to "orbital elements" and the target body to "stereo spacraft-A" or "stereo spacraft-B". I use these models to give me an idea what is in the field of view of the stereo spacecraft. The eastern morning sky at 5:00 am ACST as seen from Adelaide at 5:00 am. Similar views will be seen elsewhere in Australia at the equivalent local time (and yes, it will still be pretty cool around 6:00 am, if 5 is too early). 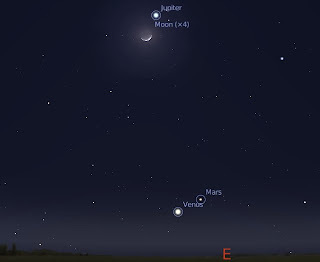 The morning of Monday, April 20 will be rather nice with the Crescent Moon just below Jupiter and Mars and Venus below it. With Jupiter a mere 3 fingerwidths from the Moon, this is another opportunity to try and see Jupiter in the daytime (or at least shortly after sunrise). Locate the Moon and then look up and to the right a little, you may (just) see a bright dot that is Jupiter (and always make sure the Sun is hidden behind something very solid so as to protect your eyesight). Keep watching, on April 22 and 23 the narrowing crescent is close to Venus and Mars (which are also close) to form a very nice triangle. Also keep an eye out for Irridium Flares. You may even see a Lyrid meteor or two while you watch. Like humans and other animals, stars have a life cycle. But how are they "born"? Why do they form in the way that they do, and how does this influence their lives? How important is gravity, or what they are made of, or where they are created? Until relatively recently these were questions it seemed we had little hope of answering, but thanks to modern scientific technology and techniques, the secrets of stars can be revealed to all. Back in March I wrote a post “Occam's Razor and the Two World Systems”, where I discussed the idea propounded by William Wallace that Occam’s razor failed when applied to the transition from the Ptolemaic geocentric solar system to the Copernican heliocentric solar system. Mr Wallace replied on that post and I promised to respond, but life (and various asteroids and comets) got in the way. Rather than add new comments there. I’ll take this up as a new post. I have a counter example, from science, fully described here, where Occam's razor fails. The idea that the "simplest explanation is probably right" was falsified when Tycho Bryhe [sic] rejected heliocentricism for geocentricism, based on his analysis of the best available data. This is so very, very wrong. Tycho’s system was not a neo-Ptolemaic system, as I describe below, Tycho explicitly rejected the Ptolemaic system based on observational evidence. Tycho accepted most of Copernicus’s system, but balked at a moveable Earth and produced a Heliocentric-geocentric system (not a geocentric system, for another animation of the respective systems see here). Indeed it is an “inverted Copernican” system, basically a remapping of the Copernican system into a reference frame centred on Earth. Tycho’s system contains nothing of Ptolemy; there are no equants, no great epicycles and so on. I’ll emphasise that again, Tycho’s system was not a re-jigging of Ptolemy, it was an inversion of Copernicus’s system. The only point of similarity between Ptolemy’s system and Tycho’s system was the Earth was immobile in both systems, but in Tycho’s, everything but the Moon rotated around the Sun. Again, the key features of Ptolemy’s system, the equant and the great epicycles were absent from Tycho’s formulation. This may seem like mere pettifoggery, after all, both Ptolemy and Tycho had the Earth as the centre of the solar system, but Ptolemy’s system was not just “everything goes around the Earth”. Tycho had explicitly rejected the Ptolemaic system, all the key features of the Ptolemaic system, taken all the planets and placed them around the Sun and grounded his system on a reformulation of the Copernican system. Tycho's system required fewer calculations and was consistent with all known measurements. Copernicus's was not consistent with observations. Tycho's system required roughly the same number of calculations as Copernicus’s, as it was basically Copernicus’s translated into Earths reference frame . Tycho fully accepted Copernican geometry, used Copernican planetary models, and where he did not explicitly do his own calculations, he used planetary tables based on Copernican models. Where Tycho was more accurate than Copernicus, it was through his greater observational accuracy, not any superiority of his model. Indeed, when he talks of his system, he notes that he has kept all the superior features of the Copernican system. Ironically, it was Tycho’s own measurements of the opposition of Mars in 1582 that showed that the Copernican model was in better agreement with the observed retrograde motion of Mars than the Ptolemaic model. And yet Copernicus' model defied experimental verification, using the best astronomical apparatus of the time (Tycho's). Actually, that’s not true. There was a key test of the Ptolemic vs Copernican system and the Copernican system came through with flying colours. It was one of the key results that forced Tycho to reject the Ptolemaic system. However, that test tends to be ignored these days because of modern commentators focusing on the issue of stellar parallax. We now know that stellar parallax could not be measured with instruments available then. It wasn’t obvious back then, and there were several attempts to measure the stellar parallax. Tycho established that the stellar parallax had to be less than 0.1 degree. However, this did not falsify the Copernican model as negligible parallax was an a priori feature of the Copernican system. Tycho was well aware of this, and his argument was not that the lack of parallax showed that the Earth did not move, but that if the parallax was so small the distance between Saturn and the stellar sphere would have to be 700 times the distance between the Sun and Saturn. A provident creator would not be so wasteful of space and produce such asymmetry in his creation. So we can see that the stellar parallax argument as used by Tycho is in the end not a scientific argument. So what was the measurement that convinced Tycho to reject the Ptolemic system? Ironically, it was a parallax measurement. 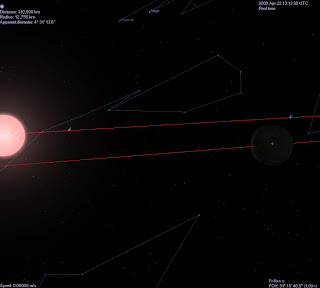 One of the predictions of the Copernican system was that Mars would be closer to Earth than the Sun at opposition; while in the Ptolemaic system Mars would always be more distant from the Sun. Tycho’s careful measurements of the parallax of Mars showed that Mars was closer to Earth than the Sun. Similar measurement of Venus’s parallax by Tycho also confirmed Copernican predictions. Copernicus was right, Ptolemy was wrong, and Tycho unhesitatingly rejects Ptolemy. But in the end Tycho rejects both Ptolemy and Copernicus. My ultimate point about Tycho's rejection of Copernican theory was that applying principles of modern science sometimes leads one astray. In this case, it was Tycho’s system failed the Occam’s razor test. It requires more assumptions than the Copernican system, introduces two centres of motion, introduces more problems with motions and whilst reproduces the retrograde motions of the planets, it no longer provides these motions as a natural consequence of the orbits of the planets. Altogether it is far less economical than the Copernican system and no longer explains the precession of the equinoxes and is affected by solar eccentricity (and this was pointed out at the time). Occam’s razor doesn’t fail, because Occam’s razor was not used to make the choice between the Copernican and Tychonian systems. What was the basis of Tycho’s rejection of the Copernican system? Let Tycho tell us in his own (translated) words. It wasn’t the principles of modern science that lead Tycho astray. The equant was seen as a particular drawback to Ptolemy’s system, if one wanted to explain planetary motion in terms of uniform circular motion, and Copernicus reformulation of planetary motion so that the equant was dispensed with. This was seen by contemporary astronomers and mathermaticians and a great benefit of the system. Tycho too saw the equant as something undesirable, and the great epicycles of Ptolemy as unparsimonius. Tycho got rid of Librations, but generally his scheme was Copernicus’s recast from Earth’s frame of reference. Ironically, Tycho’s system made the acceptance of the Copernican system easier. It made people familiar with the Copernican system, and smashed key sections of Aristotelian physics which have proved a barrier to acceptance of he Copernican system. The Reception of Copernicus’s Heliocentric Theory 1973 ed Jerzy Dobryzcki, Reidle esp Chapter 3. Over at Spaceweather is a post on the sounds of Jupiter. With simple, home built radio telescopes (you can get a kit here) you can listen to radio storms on and above Jupiter. You can see and hear some L- and S- bursts from interactions of electrical currents flowing between Jupiter's upper atmosphere and the volcanic moon Io here and here, and further MP3's of L and S bursts here and here. Carnival of Space #98 is here. Carnival of Space #98 is now live at The Universe Today. There is starship design, unaired StarTrek episodes, extraterrestrial DNA and much, much more. Zip over and have a look. It turns out I did far more astronomy over Easter than I had thought. Some of our Melbourne cousins came over, and the boys (well Young Adults and their Dad) were really interested. They got me to get out my telescope a couple of times. The first night we were standing under the stars as the car was unpacked, when the Hubble Space Telescope and another satellite went over us close together. The next night I set up the Don, the 8" reflector, and we spent most of the night watching Saturn. Unlike the Earth Hour star party, the sky conditions were almost perfect, Saturn was beautiful and crisp, and not only could we see Titan, we could see Rhe and (just) Dione. I tried out a variety of lenses and Barlow combinations for the folks, and had a constant stream of people wanting to look. Well, Saturn IS fabulous, and the boys and adults just couldn't get enough. Two nights later we did the Telescope thing again. Again Saturn was crisp, and this time Titan and Rhea were relatively close together, with Dione (just) visible on the other side. The Moon was just enough past full for there to be enough Luna craters to be worthwhile. Again, everyone was entranced by this, and EldestMaleNephew now has an image of the Moon on his mobile phone. The images above were all taken with my Canon IXUS "point and shoot" camera held up to the lens. Not bad really. The Cousins are now back in Melbourne, and our boys miss their boys. We all had an excellent Easter, and had some good Astronomy to go with it. What adventures will we have next Easter? The first publicly available images of C/2009 G1 Ruan are now available. See Erik Bryssinck's images here. UPDATE: Thanks to Dimitry, (see comments) I've fixed up the elements for Celestia. Looks like I will have to update my "how to make" instructions for Celestia (here) and Stellarium (here). I've put together the orbital elements for C/2009 G1 as files for Stellarium and Celestia. For Stellarium, add the section to the end of your ssytem.ini file (always back up). For Celestia, add the file to the extras folder. The only problem is that Celestia puts the comet nowhere near where it should go. I have no idea why and will try and fix this (fixed via Dimitri). 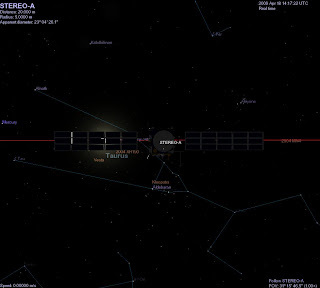 If you want elements to add to a planetarium program like SkyMap, see this link to the MPC elements for planetarium programs. .. to look for L4/L5 asteroids. See their latest article on the L4/L5 asteroids. Hey! I was one of those! Readers, you may be able to help. The STEREO team is inviting the public to participate in the search by scrutinizing photos as they come in from the spacecraft. (Puts up hand) Pick Me! Jiangao Ruan's comet (C/2009 G1) makes the News! At least the Sungrazer News! Go have a read! UPDATE: Confirmation of the comet from Earthside observer K. Kadota in Japan. See this MEPC with updated orbital elements. And I have made a spotters map of the eastern morning sky with the updated elements. I have no idea whether Jiangao Ruan examines his STEREO images in the small hours of the morning, or looks at them over breakfast, as Comet Al does, but on Wednesday Jiangao sent a message to the stereo hunters group asking if a faint blob he saw transversing the STEREO H1b camera images was a known comet. In quick time the stereohunter community swung into action, we confirmed the object, and in rapid time eliminated 209P/LINEAR, C/2008 T2 - Cardinal, P/2002 JN16, 2009 F6 (Yi-SWAN) and 446 Tisiphone, the only objects vaguely near the unknowns position, as candidates. This looked good as a new comet. Karl Battams sent in a whole bunch of measured positions to the MPEC, and we waited. While we waited, we tried to work out where the comet was as seen by an observer from Earth, to alert the local telescopic community. 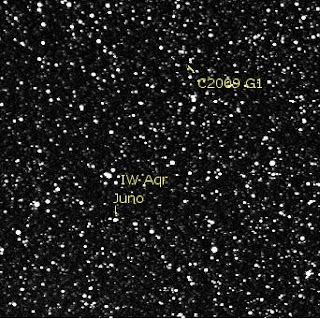 Then the news came back, Jiangao's comet was named as C/2009 G1 (STEREO). And there was much rejoicing. To my knowledge this is only the second comet to be discovered first in the STEREO imager (as opposed to Comet Al's recovery of C/2003 K2), they are usually picked up in SWAN or SOHO first. Sadly the comet is currently in a very unfavorable position, very low to the eastern horizon in the morning, with the full Moon in the sky, this will make it hard to see for several days. It will get better. 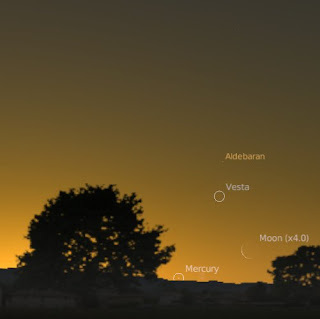 By the 18th of May, the comet will be 26 degrees above the horizon at astronomical twilight (as seen in Australia), with a last quarter Moon in the sky. My animation of the comet is here, the comet is near the top right, and the asteroid Juno is near the bottom centre. Adam Hurcewicz has an animation here. One of the Shuttle astronauts, Sandra Magnus, has a blog. Okay, so the shuttle has landed, but go read her post on waiting for nightfall on the shuttle. I've got an account at Global-Rent-A Scope now. This is a group that sell time on remote controlled telescopes, with a bunch of scopes in Australia. 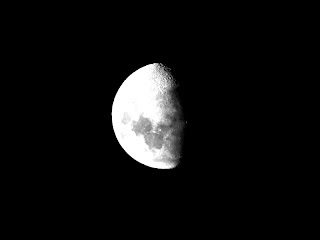 Of course, the Moon is so bright at the moment that imaging anything other than the Moon is a waste of time. To the left is a test picture done with their "point and click" telescope. When I get a bit of practise, I can do some nice comet imaging like Comet Al (and see his picture of Eta Carina). So we had multiple birthday parties this weekend. We shuffled off EldestOne to a friends party/sleepover, SmallestOne had a fairy disco and we were having MiddleOnes friends over for a party and sleep over. So of course the drains block up, toilets overflow, you get the idea. One emergency plumbing visit later the party is on track, kids are water bombing each other and having fun. The they make giant biscuits for a giant biscuit-icecream cake, the kitchen (just survives). The Bettdeckererschnappeder weisle is just about to take out the final biscuits when the handle of the oven comes off, and the oven door comes apart. Makes the Fish and Chip supper a bit difficult to cook. Then the star party I was going to have with the boys was clouded out. Oh Well. Still, the boys had great fun despite all the disasters. How was your day 3 of the 100 hours of Astronomy? Mine was largely clouded out. In the spirit of Galileo's 400th anniversary of looking through a telescope, and in the sprit of doing alittle more than just looking up, why not do some sketching? The Moon is bright and is showing plenty of craters, so this is a good time to sketch the Moon. All you need is a paper some pencils and, say a pair of binoculars. Galileo's scope wasn't much more powerful than this. It can be a bit difficult to hold binoculars and sketch at the same time, so use the back of a chair or table to stabilise the binoculars. Have a go, you will see how much fun it can be! Carnival of Space #97 is here. Carnival of Space #97 isnow up at Cheap Astronomy. There is the return of the Mars Express Webcam, Mars Postcards, salty water on Mars, Dark Matter and much, much more (a whole lot that dosn't involve Mars too). Clip out coupon and come on over! Just did a short radio interview with Ashley Walsh, which I messed up mightily. True, I do have a cold, so I sounded like a demon duck rather than anything human, but my brain went "fizzt" and, despite preparing carefully the night before, writing down key points and dates, and revising them before being rung up, I stammered and hummed and hawed, neglected to mention either viewing Saturn or the Hubble Space telescope pass tonight. So to cheer everyone up, here a link to the Best images of Saturn from Cassini. Why not hold an impromptu star party! The 24 hour Global Star Party (note, this site is currently down while Around the World in 80 telescopes is running, due to high server load, it will be back later) is on Saturday 4th April, all you need is a patch of sky and some friends and neighbours. If you are having a barbie with friends, just look up. Over invite the neighbours over into your back yard for a while. We will have a thousand screaming kids over for MiddleOnes birthday. Dust off that old telescope that has been lurking around in a cupboard gathering dust. What about recreating Galileo's adventures and explore the sky with binoculars or the old kids telescopes lying in the toybox. You don't even really need telescopes or binoculars, just navigate your way around the sky and look for meteors or satellites. In Adelaide, at around 8:07 pm the Hubble Space telescope will glide through Gemini and underneath the Moon. The Moon is in First Quarter phase, ideal for pointing telescopes at, and Saturn is high in the sky and is a big hit with everyone. 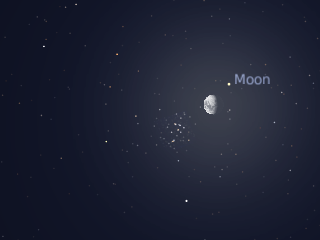 Tonight (Saturday night) the Moon will be near the Beehive star cluster,which will make for nice viewing. You can even try and measure the movement of the Moon through the sky with reference to the Beehive. Want to go out and do something special? Go to the Australian IYA site and look at the Calendar of Events. Check out your local astronomical societies or planetariums events. For example the Astronomical Society of South Australia is holding public viewings on Saturday. A planetarium Session at Uni SA, Mawsons Lakes, Saturday 4 April, 3pm, Admission: Adults $5, Children $3.50 and a public Viewing Night at the Grassed area, Black Forest, Forest Ave Saturday 4 April, 8:30pm, Admission: Adults $4, Children $1. If you are up early in the morning, the moons of Jupiter are easily visible in binoculars (I was just looking at them before, and a satellite swept underneath Jupiter while I looked). And Venus returns to the morning sky, its dramatic crescent should be visible in binoculars. So much to see! Have a great 100 hours of Astronomy. What to do on day 2? Well, you could watch for satellites, there's a few going around at the moment. Sadly, iridium flares are few and far between, and the International Space Station doesn't pass by until Sunday, but you might juts see the Hubble Space Telescope. If the skies are cloudy, at around 7:00 pm AEST the around the world in 80 telescopes webcast begins, so you can tune in to that. UPDATE: The links at 100 hours of astronomy appear buggy. I've edited the link so it works now. Also, the live USTREAM video doesn't work for me, but the saved videos do. Pity the popup ads on the video are so annoying. Southern Skywatch April 2009 edition is now up! The April edition of Southern Skywatch is now up. There is the return of Venus in the morning, the Moon near the Beehive cluster, the Lyrid meteor shower, and more. This is the first night of the 100 hours of astronomy, so make sure you go outside and look up. Even if it is cloudy, the glow of the Moon through the cloud will be interesting. But why just look? This also being the celebration of Galileo looking through a telescope, why not do some measurements? Not complex measurements to be sure, but something simple. Like, how fast does the Moon move? All you need for this is a stick (a broom handle will do fine, or a camera tripod if you have one) and a ruler or protractor. Tape the ruler or protractor to one end of the stick and you are ready to go. Go out and look at the Moon, and find a relatively bright star close by. 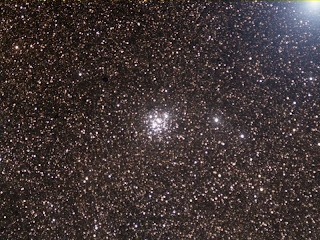 Tonight this will be epsilon Geminorum, tomorrow kappa Geminourm and Saturday night delta Canceri and the beautiful Beehive cluster (see image above). Using the Ruler/ protractor measure the distance between the Moon and the star. You may need a torch with red cellophane wrapped around the business end to not destroy your eyesight and read the markings. Do this again every half hour for a couple of hours. How far does the Moon move? We are also using a straight ruler, and the sky is curved (or rather the Moons path is a curve). How does this affect your measurements? Does the Moon move the same distance each night? Update: If you have rubbish eyesight like mine make a home-made ruler with division in thick black texta. My attempt was foiled by cloud after my very first measurement. Carnival of Space #96 is here. Carnival of Space #96 is now live at Astroengine. This bumper issue asks such thought provoking questions as "what planets were visible when the Titanic sank?" "Is the Kepler mission a waste of time?" "What makes a planet habitable?" and much, much more. Ignite your afterburners and head over to Astroengine now!